Heavy snow on a roof can pose a serious risk to the structure of a home. In parts of New England, where 6′ of snow have fallen in the course of 17 days, widespread roof collapses have prompted news outlets to advise homeowners to remove snow from their roofs if it is safe to do so. With more winter storms on the way for the Northeastern section of the country, it’s important to recognize the warning signs that your roof may be under too much stress and know how safeguard your home from damage. According to DisasterSafety.org, most residential structures are built to withstand 20 pounds per square foot of snow before becoming stressed. But not all snow is created equal – you can typically have 4 feet of fresh snow on an average roof before it becomes stressed. But only 2 feet of packed snow will result in the same amount of pressure. And amazingly, 1 inch of ice is equivalent to 1 foot of fresh snow! If snow or ice exceeds 20-25 pounds per square foot on your roof, you should consider removing it if you can do so safely. – Be sure the perimeter around the home is clear of people that could be injured and/or objects that could be damaged by falling snow. Keep a safe distance from the eves to avoid being in the path of falling snow and/or icicles. – Be sure the falling snow does not block ventilation openings, drain downspouts, or building exits. 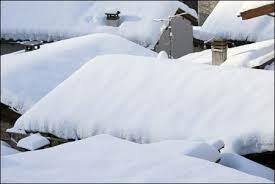 – Avoid putting snow into piles on the roof and remove areas of thickest snow first. – Leave at least 2 inches of snow on the roof as completely removing it can cause leaking and damage.